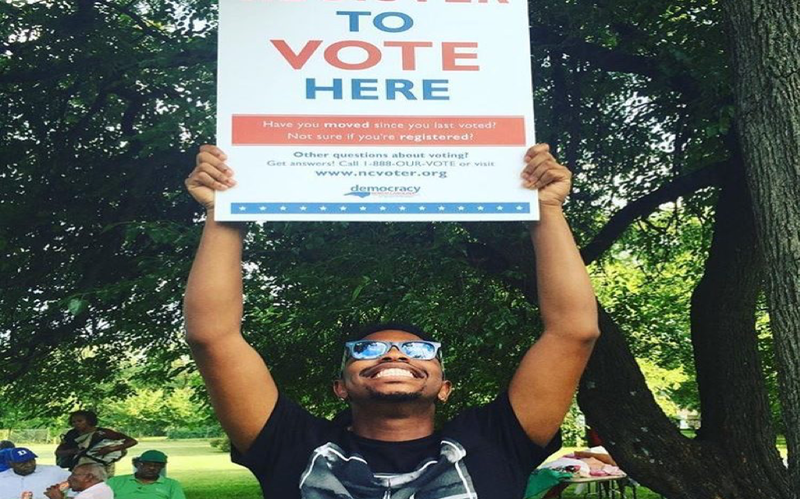 For weeks now, a big initiative we have been working on is early voting advocacy. We have been attending the Forsyth county Board of Elections meetings, asking that the Board consider making the Anderson Center an early voting site again. The site was used in 2008 and 2012, but in 2013 it was taken away due to a controversy surrounding statements that were made. According to Ken Raymond, Chair of the Board, he overheard (from only two people might I add) that students were being given credit to vote for a particular candidate which resulted in the Anderson Center being removed as a site. Many members of the public have expressed their dissent towards that decision for years. Let us remember, it is now 2016 and these allegations and decisions were made 3 years ago. W.S.S.U. students and members of the East ward community (both predominantly black communities) are suffering from this decision. I will not even get into the long history African Americans have had with voting rights in the US and how these actions are treading on the waters of discrimination and disenfranchisement. Instead, I will speak to my own experience as a student at Wake and admit to my privileges. In the primaries, my access to the polls was easy. It was in a good location and there were resources that allowed me to make it to the polls in an efficient amount of time. I also have my own car which really helped not just myself, but others as well. At W.S.S.U., this process is not easy and many people have expressed this to the Board. Freshman are not allowed to bring transportation their first year, and according to students at W.S.S.U, many upperclassmen also do not have their own means of transportation. As a college student I can completely understand how this can inhibit off campus mobility. College students have tons of school work, engagements, and other things that are time-consuming, so voting, a fundamental right and civic duty, should be made as easy and accessible as possible. At first, it felt like no one was engaged in this issue, but now the community is catching on. Community leaders, professors from local universities, students, everyone is showing the Board that college students will not have their voices pushed aside. This is our democracy as well. Winston-Salem State University Student Government Association President speaking about the parallels of historic discrimination in the voting process and the actions the Board is currently taking. Older PostNews Flash: Your Vote Matters.